This year’s American Music Month celebration kicks off today with a special 8pm banjo workshop this evening at Urbana’s Community Center for the Arts. 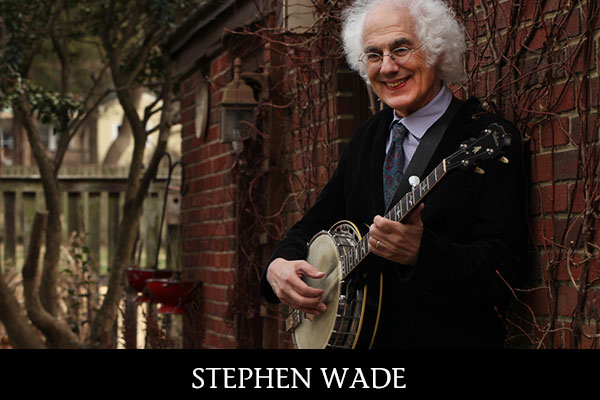 Tomorrow Stephen will give his talk, “Beautiful Music Around Us: Exploring America’s Rich Banjo Heritage,” at 12:00pm at the Sousa Archives and Center for American Music. He will be bringing several of his historic banjos to complement his talk and the Center’s new “Samuel S. Stewart and America’s Banjo” exhibit which opened last week. Finally, his special concert, “Reconstructing America’s Rich Banjo Heritage,” will take place on Friday evening between 9:15 and 10:30pm at the Community Center for the Arts. All of these events are part of this year’s Folk and Roots Festival which the Center is sponsoring. While the workshop and lecture are free there is a $15 admission to his concert performance. For those folks who have not experienced Stephen’s energetic performances and talks before, he is arguably the best “non-bluegrass” banjo player in America today. His concerts and talks are artistically inspired from the folk songs, stories, banjo tunes, and personal insights that he has encountered over decades of research and performances with countless musicians from around the country. So if you have a hankering for historic banjo melodies and lively folk tales that are combined with his deep understanding of America’s banjo heritage, why not stop by the Community Center for the Arts and the Sousa Archives and Center for American Music for some exciting music experiences. For further information about any of these programs please visit the Sousa Archives events calendar or just give the Center a call at 217-333-4577.